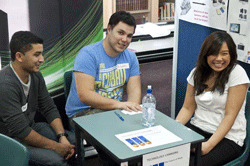 The ‘Future of Work’ Expo, held over three days from the 25- 27 of May, presented students’ responses to the question what will the future of work look like and why should we seek to know? For the past 20 years, workers, businesses and the community have been fed high expectations about the future of work: the paperless office; increased leisure hours; work-saving technologies; green industry and workplaces; work and family balance and global opportunities for firms. The Future of Work Expo gave students the opportunity to discover the truths of these claims first hand. Drawing on the Enquiry Based Learning Method, School of Management students looked at topics such as women in the workforce, technologies increasingly influential role and the effects of globalization on the workplace. Student groups then presented their findings in an expo forum using all tools on hand, including video and web-based content; slides, posters, magazine and radio content and annotated photographic displays. According to the subject convenor, Dr Rosaria Burchielli, who has published internationally on work intensification, work-life balance and informal work, knowing how work will likely change in the future is important for individuals, businesses and policymakers in order to plan for and influence the future. Employment change is a reality for workers across the globe and the Expo shows how students engage with this reality and involve the community in reflecting on these issues. The method of enquiry implemented by Dr Burchielli relies on a framework within which students self-direct their research-study and through the process of group work garner a stronger grasp of their topic. Considered to be at the forefront of teaching and learning innovation, Enquiry Based Learning is notable for the depth of study and knowledge-retention experienced by students. Congratulations to the Future of Work students and Dr Burchelli for another successful teaching and learning endeavour.